The year was 2002. That’s when Patrick Tighe called to tour us through one of his first completed projects since launching Patrick Tighe Architecture. We had first met him in 1998, when he was at Morphosis. But this time, he had transformed a Los Angeles tract house into a striking hybrid, melding domestic and gallery settings for its art-dealer owner. We snatched up the project for immediate publication, and the start of a beautiful friendship was born. The lobby of Connexion Burbank in California, 2016. Photo­graphy by Matthew Momberger. Perhaps that approach stems from his childhood. Tighe was born in Lowell, a Massachusetts mill town. His father was a bricklayer. His mother, who raised Tighe along with his four brothers, had emigrated from Ireland at 17. Working hard was in his DNA. After earning his BFA in interior design and sculpture at the University of Massachusetts, Tighe headed west to UCLA for his master’s in architecture. Why California? Because of its sense of optimism and adventure, he notes. He counts David Hockney’s painting A Bigger Splash as another seducing factor, its composition of “mid-century modern architecture, clean lines, and vivid colors” so different from where he grew up. Why architecture? “Both technical and creative, it affords so much to do each day and learn over a lifetime.” He began his career at Frank O. Gehry and Associates, before landing at Morphosis. 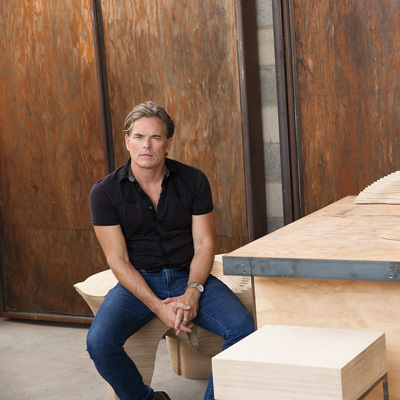 Since founding his own firm in 2001, he’s earned the Rome Prize, nine Interior Design Best of Year Awards, and countless accolades from the AIA, including being elected into the College of Fellows in 2011. 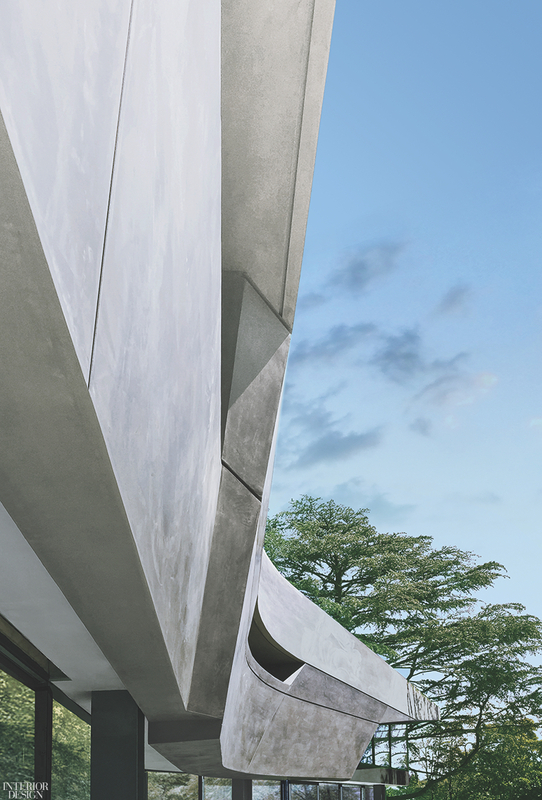 More recently, our June cover featured Tighe’s spectac­ular sculpture of a house in the Hollywood Hills, its curves a composition of transparent and solid strata embedded in the terrain. But Patrick Tighe Architecture doesn’t design just for the privileged. The 15-person studio is equally invested in dwellings serving those in need. Courtyard at La Brea, for example, is a mixed-use affordable housing project in West Hollywood for formerly homeless LGBTQ youths, its rational courtyard plan juxta­posing with a swirling edifice of robotic fabrication. Nearby, the residents of Sierra Bonita, also affordable housing but for those living with disabilities, each have a front porch overlooking a central courtyard and eye-catching latticework. “Design doesn’t discriminate,” Tighe states. Commercial projects make up the firm’s portfolio, too. 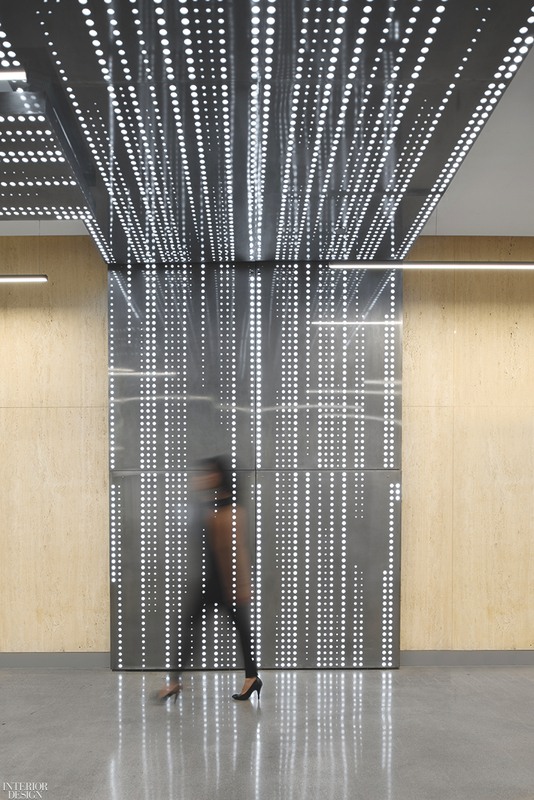 For Moving Picture Company, located in a generic Santa Monica office building, Tighe crafted a fluid, organic interior, where programmable LEDs highlight lacy laser-cut walls. At the Douglas Elliman West Coast headquarters in Beverly Hills, he and his team connected its two floors with a swooping white plaster stairway. The Hollywood Hills residence and cover image of the June 2018 issue of Interior Design. Photography by Antonio Follo/Patrick Tighe Architecture. 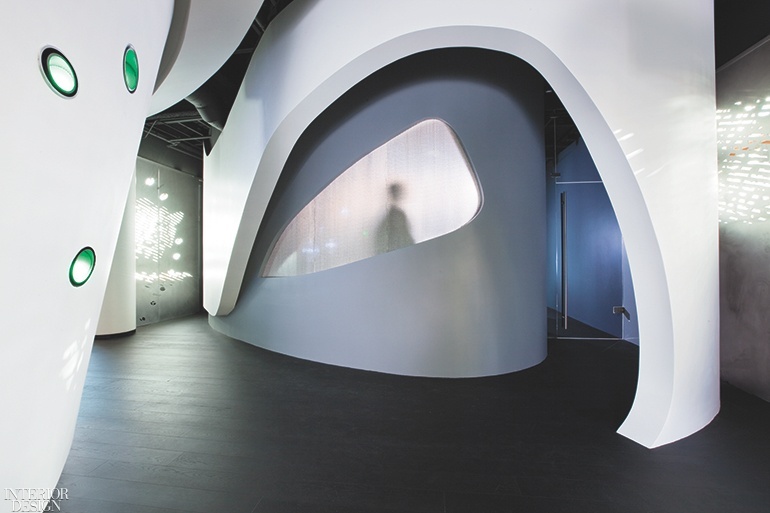 Tighe went truly experimental for Out of Memory, his 2011 installation at SCI-Arc Gallery that explored the structural and acoustical properties of soy-based polyurethane foam. “We sprayed it on to the formwork and let the robot loose to carve out the interior,” he recalls. The carvings mapped the frequencies of sound recordings by Ken Ueno, a composer Tighe met during his time in Rome. Fashion designer Rick Owens, upon seeing (and hearing) the installation, commissioned the architect to create a facsimile for his shop-in-shop at Selfridges in London.